Thought I would chat about small spaces and in my opinion the easiest spaces to design as it’s more restrictive so not so many options to look at!! I sort of usually nail it in one hit but for most people they struggle with knowing what to do. This is down to the main focus being to make the space look bigger……wrong! Design it like any other space, firstly what is the room used for and then fill it, yes fill it with what is required. Don’t be afraid to use normal size furniture, one of the biggest mistakes is using teeny weeny pieces of furniture, it ends up making the space look wrong. A key elements is storage, if the budget allows a clever use of built in storage is great, lets say shelving unit going up to the ceiling for instance and wall to wall! A cheaper alternative is joining shelving units from ikea! Almost everyone I talk to paints the walls pale, for me it’s a myth that pale colours make the room look bigger, it’s what you do with the space itself that counts!! so painting the walls darker will for sure give it a cosier feel but it won’t make the space look smaller, it will be far more interesting than boring pale walls. 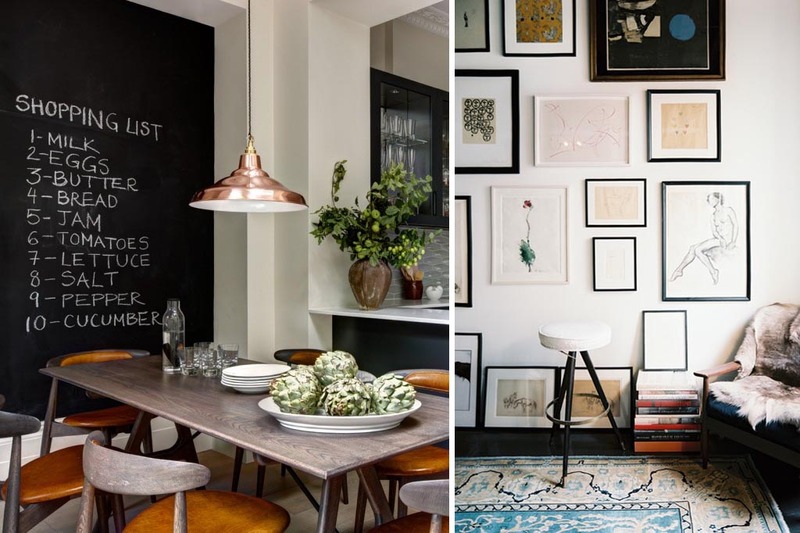 It’s then how you dress the walls, say one wall of storage then fill the other walls with pictures, a trick is to hang the pictures (lots of them) from floor to ceiling and add mirrors as the reflection is so much more important to make a space look bigger than going for pale walls. Another trick that I have done many times is hanging blinds from the ceiling hiding the wall above the window, this elongates the window and gives the illusion that ceiling height is bigger. Painting the ceilings the same colour of the walls also does the same thing but I know this is a scary move as many are afraid of bringing the ceiling down! but it does the opposite as it stops you from looking at the ceiling and doesn’t bring your attention to it. If this is too big a step, try jumping down a shade lighter for the ceiling. And the last thing is using larger items, not all the pieces but at least one, my favourite is an oversized lamp, it will enlighten the eye and make you think this belongs to the space almost tricking the brain into thinking the space is bigger than it really is. Some pics below, all mainly of New York pads as there ares o many bijoux apartments but the interiors are very cleverly designed. Personally I would rather live in a home like this than a massive open plan room with little furniture and no atmosphere. Right time to sell up and find a small pad! sorry kids!! Put the intrigue into interiors! Anyway down to business! Designing interiors with intrigue. If u don’t add an element of surprise you end up with a snoring interior, aren’t we all bored of the beige tone interiors out there!!! To make it more interesting add a little intrigue! Now this could be simply by adding an unusual object! Or just doing something which throws it of course!! So if u already have a neutral scheme and don’t want to paint try adding a large scale graphic rug or a mixture of art which could be vintage posters, cheap as chips!! One of the coolest ways is a large scale lamp and even cooler try an Abigail Ahern dog lamp that will totally through the scheme off a little. Pics below show some great interiors, I know not everyone’s cup of tea but break it down and it starts with quite a classic look, use this style of furniture! Then start adding the objects and this creates the interest a bit like adding accessories to an outfit (if your a lady). Get the basics right then it’s up to you how far you want to push the boundaries, this look has no rules so push as much as you want, even if you add a few objects of intrigue it will change the overall look, budget depending of course!! A cheap way is to paint the walls, u can be brave and go a full on colour, harder to pull off or just go that bit darker and this will show off the objects to another dimension!! Pics above are similar in regards to items but wall colours are totally different and shows you that having some interesting objects can work in both settings, the colour on the walls totally changes the look and is more individual to the person living there. I think both work well, strip out the interesting objects and the furniture is quite classic…. no!! Love this one, I know not everyones taste but I think the use of colour is great, and the zebra rug is what throws it of course as is has a traditional rug underneath! One of my favourite American designers Kelly Wearstler is a maestro at adding intrigue to interiors, love her objects, especially the gold hands in the table setting! 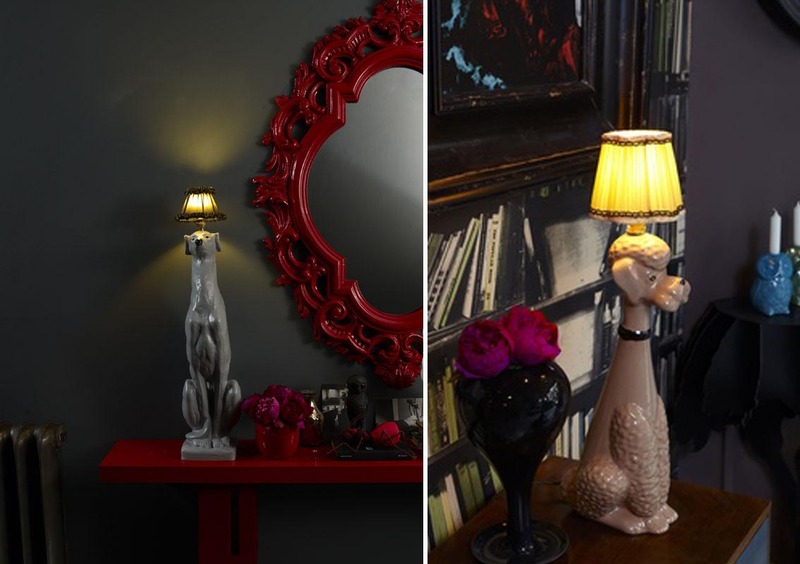 My favourite British designer Abigail Ahern and her famous dog lamps! Might get some of these in the shop!! 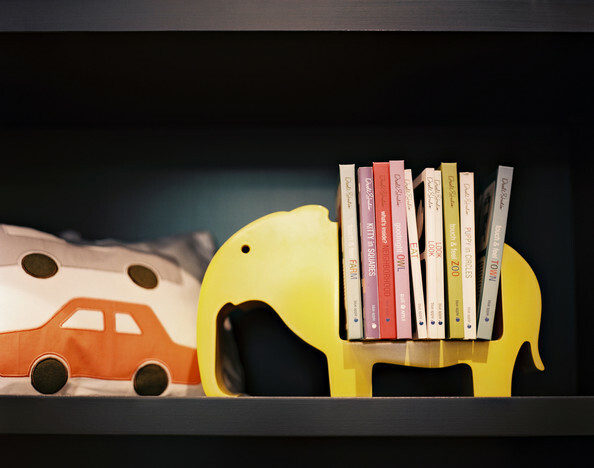 And even if it’s a small item like this elephant book holder, it still does the job perfectly, much better with a dark background!! Sorry guys lots of pictures today! 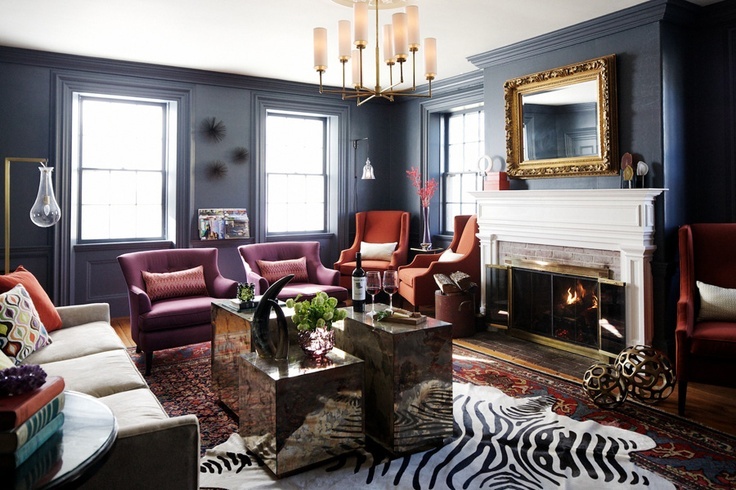 Pics courtesy of lonny Mag and Abigail Ahern Pinterest! Not a great start to the week, think I was out in the sun too long on Sunday and was ill the start of the week, feverlike!! Talking gyberish in my sleep (no change there then I hear you say!!) But it’s so nice to have heat it’s just too tempting not to stay outside. So becasue the weather has been so good the bedroom has taken a back seat, and it’s not going to get started for a few more weeks as away the next couple of weekends. Hopefully will take a few days off in the summer to finish it or even start it!! Today I thought I would talk about the dreaded colour black, in my opinion one of the most under estimated colours and in my book one of the most importmant. 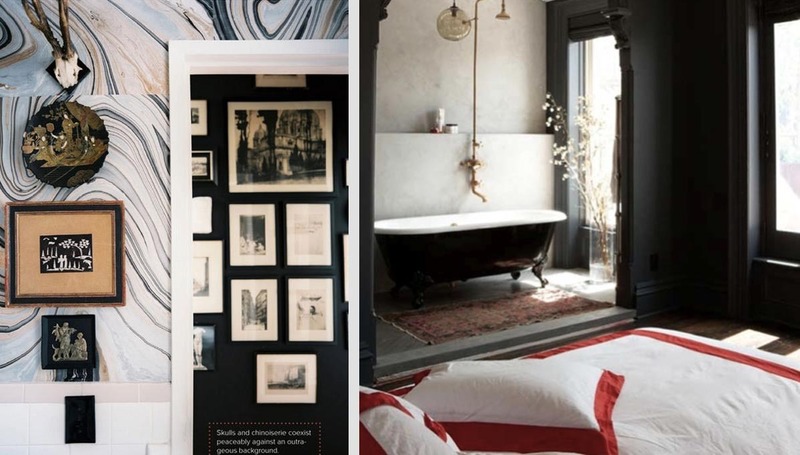 Use black in the right way and it can totally transform room, picture, acessroeies etc etc, it literally works with all things. At the moment I am a fan of black walls, I know, I know I can hear you all saying yuk isn’t it a bit gothic and depressing but I don’t think so, get the correct hue of black, not too dense almost a nearly black (F&B do a great one called Off Black) or if not a very dark grey will work just as well. Best place to try this out could be in a hallway as this is a space you don’t spend all your time in. It could be just one small wall at the end of a hallway, a few pictures plonked on the wall and you’ve created a great little feature. Another great way of trying out a black wall is in a Kitchen as a blackboard wall, you can get blackboard paint from any DIY store. You could always paint it as a strip from floor to ceiling if you haven’t got a small wall. 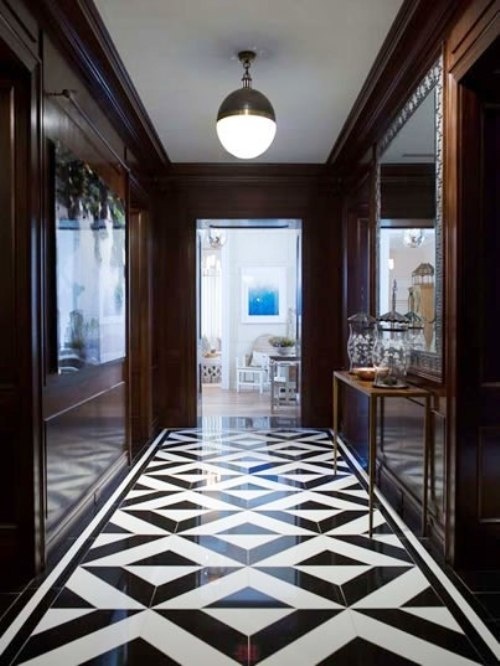 Another thing for me is black floors, I love them as I think it makes all the furniture look so much better, almost acts as a stage and contrasts so well, rather than blending in and looking boring, definitely going for black floors down stairs when I refurb (which could be a while). 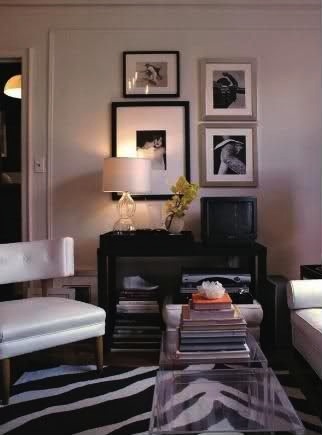 If your not brave enough to use black on the walls or floors you can use it pretty much everywhere else, lamp shades a good one, picture frames (for me they contrast against the wall beautifully) A tray on a side board with accessories on, or simply one small piece of furniture like a side table would work really well. Take a look at the pictures below, I hope you agree that the black is what makes most of these interiors. I know you have seen this pic before, but perfect explanation of how good black can look in an interior, not just on floor, windows, shelving unit and the sculpture on the table works a treat. One of my favourite pictures and I keep using it but the black wall with all the pictures looks great, the pictures break it up perfectly. And if you are daring enough the pic on the right has all walls painted!! Another thing on my list is having black kitchen cupboards, love the left pic which is one of my favourite American designers Nate Berkus, the units where previously white but look so much better in glossy black, much more sophisticated. Now go paint something black!! I’ve actually got a day off today!! playing Golf with my father and brothers (a fathers day gift and a very rare occasion). On the weekend I went to a new spin class studio, I’m desperately trying to get back into the fitness, sort of lost it a bit the last few weeks so hoping this new spin studio will get me motivated again so Iv’e booked in for another one tonight! Going to try and get 4 exercise routines in this week!! 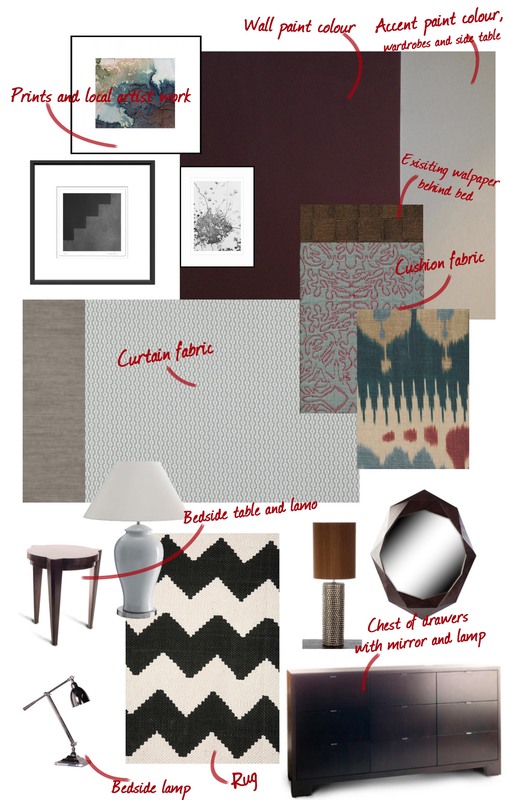 As I previously mentioned I am working on the scheme for my master bedroom, first I’m pushing the boundaries with going for a very dark colour on all the walls. This is even a bit scary for me but I’m thinking as long as I break this up it will work perfectly. So lots of pictures are going to feature and the painted white ones will look great with the dark background of the walls. Also I have decided to do one wall of curtains which will also break up the colour. As the budget is tight, I am using a side table from the lounge and a ceramic lamp which has already transformed the space, so we no longer have matching side tables and lamps (which is sort of growing on me, always done a matching pair before!). We already have a modern looking chest of drawers which works well, so will look out for a simply chair to add to the space then the rest is down to accessorising, I’m going to add lots of faux flowers as this is one of the best ways to through the eye around. Then paint out the wardrobes and we will be there. Think I have also found the perfect zig zag rug to finish it off and at a steal of only £65 from urban outfitters. Fabrics are from Mark Alexander and Lewis and Wood, furniture, lamps and art are all available from my store in Bristol.